Digression: During my last visit to Austria in 2016, Fritz mentioned that a new government had been instituted and, as a result, the future for cultural affairs funding looked promising. Obviously, and, in keeping with what is going on worldwide, that promise never came to fruition. And while, on a certain level, I find this disheartening, I am nonetheless extremely ambivalent about such funding. Much, if not most of what gets funded these days (and for some time) is essentially window dressing; salve for the status quo. Those who seek and receive such support look towards and customize their grant applications to reflect prevailing trends and fashion rather than out of creative necessity. Thus, they are more opportunists/politicians/businesspeople — in all “careerists” — than anything else. Art, for me, is a(n ongoing) revolutionary act/struggle; questioning and challenging the culture at large as well as oneself. (And by “revolutionary”, I do not mean self-consciously transgressive or gimmick-laden. Something akin to true subversion, and from there, evocative art is to be found in the subtle; the resonant; the necessary. Ananke.) Naturally, upon occasion, wonderful, challenging, questioning work does receive the token blessing of the state or robber baron fortunes. But, this is the exception rather than the rule. And, in that scenario, the artist him/herself must assess the impact/effect of that “success” on the work going forward. (Otherwise, they risk diluting their vision for further “reward”.) From another angle, I would feel less ambivalent, and even somewhat supportive if the money from funding cuts in cultural affairs went to providing those on the low end of the socio-economic strata with food, housing and health care. But, of course, if the world’s economics weren’t so skewed to the vile and corrupt — the war machine for example — heinous disparities, while not eliminated, could be readily mitigated. And, from there, funding for cultural affairs could be administered in a manner beholding to art’s inherent potential. However, I don’t see that happening…ever. 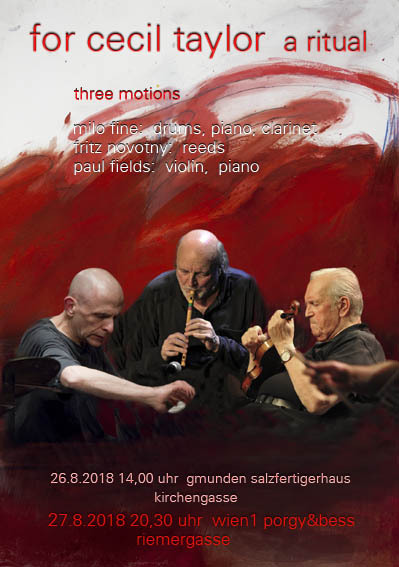 On August 27, Three Motions, becoming the reformARTseven for the second set with Rina Chandra, Johannes Groysbeck, Raoul Herget and Franz Koglmann will be immersed in “a ritual for Cecil Taylor” at the Porgy & Bess club in Vienna.